Vodafone has been operating in Turkey for more than 10 years. In 2015 it had about 21.87 million subscribers of 73.6 million, which is almost 30% of the market. The quality of coverage of this operator can be called a cross between Turkcell and Avea. 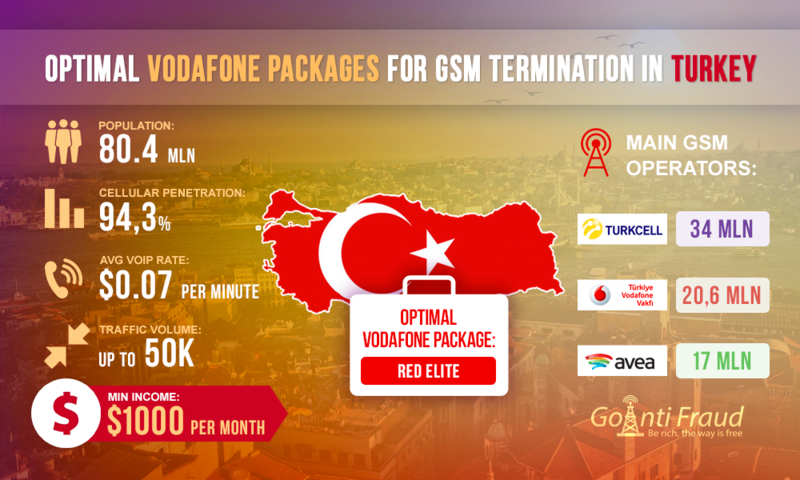 However, as none of the Turkish operators, Vodafone offers more than 30 pre-paid packages for its subscribers, from which you can choose the most convenient for you. They are Flexible, Mental, and Red. However, most of the proposed packages include a limited number of minutes for calls in the network, which is not suitable for termination as there should be optimum conditions to connect voip. In this case, it is important to choose unlimited packages with the best tariff, unlimited bandwidth and a sufficient number of minutes. Then, perhaps, the operator would not suspect termination. GoAntiFraud will allow you to minimize the risks of the SIM-lock in the GSM termination. Reduce business costs on the purchase of new SIM-cards by buying the service license and you will get more profit! From this point of view, the best solution for the business voip service in Turkey is Red packages, especially Red Elite. They are divided by another 2 tariff plans: Red Elite Plus numara taşıma kampanyası and Red Elite. These packages are the most popular among young people, who own smartphones and want to talk longer. That is why the packages of Red Elite series can be used in the termination, since the operator provides from 8 to 10 thousand minutes for any favorite direction. Red Elite Plus numara taşıma kampanyası provides free family calls as well. This means that uninterrupted incoming/outgoing calls will not be perceived by as a GSM-operator as something suspicious. But you have to make a fixed monthly advance payment of $38.60 to $55.15 to connect. One minute via these tariff plans will cost from $0.0049 to $0.0055. Originators offer $0.0957 per minute for Vodafone traffic termination. Net profit per minute will be $0.0908 - $0.0902. If you install gsm voip gateways, your monthly income will be between $1,144.08 - $1,136.52, from only one channel. To prevent blocking of SIM-cards, use GoAntiFraud. Efficient tools for the simulation of human behavior on the GSM networks will allow you to significantly increase your revenues.